CakeSpy Note: I am reposting this recipe because it's featured on Serious Eats this week! If there is one thing I love even more than a great baked good, it's a great story. And if it's a story about a baked good, well then, all the better. During the early 1900s, the height of Italian immigration...many people came from Calabria in the "toe" part of boot-shaped Italy, right across the Mediterranean from...Sicily. 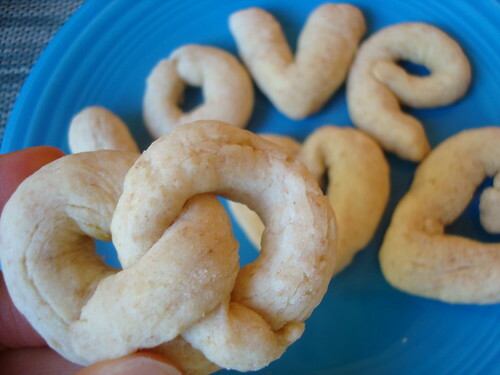 When women of Calabrian descent become brides, beautifully arranged platters of these almond-flavored cookies are often served at the reception. ...well, all I can say is that I had to try this recipe. It's not hard to see why these cookies are a time-honored tradition. They're simple to make, but the pleasure that they provide is tenfold: like a slightly drier and less sweet version of a sugar cookie, they taste delectable when dipped in strong coffee (or even wine!). They're truly the stuff of memories: as one Italian CakeSpy reader put it, "My grandparents had them at their wedding reception in the 40s. Nowadays only few families still know how to cook them and it is possible to buy them only in very small traditional bakeries in the countryside." Now, I did make some alterations to the original recipe. First, because I happened to have a half wheat/half all-purpose flour mixture left over from a recent baking project, my batch was made with some wheat flour (we thought it tasted pretty good, actually!). And second, while the original recipe called for a light almond paste, sugar, and cream glaze, I served mine without--as hard as it is to admit this, they actually didn't need it. (Of course, if you don't believe me--and I don't blame you--the frosting recipe is written below). Preheat the oven to 350 degrees F. Either grease baking sheets or lay out some parchment paper. Set aside. Beat together the eggs, oil, granulated sugar, and salt in a large mixing bowl until smooth. 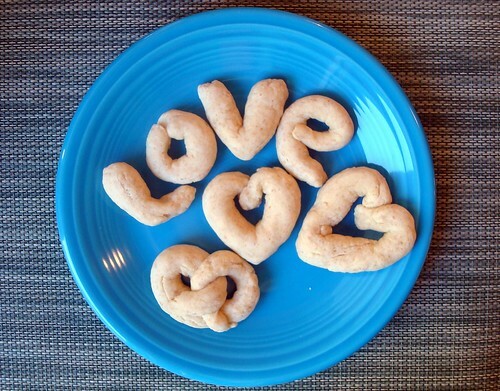 Stir in the milk, almond extract, baking powder, and enough flour so that the dough becomes stiff. Knead the dough either by hand or with a dough hook in a mixer until smooth. 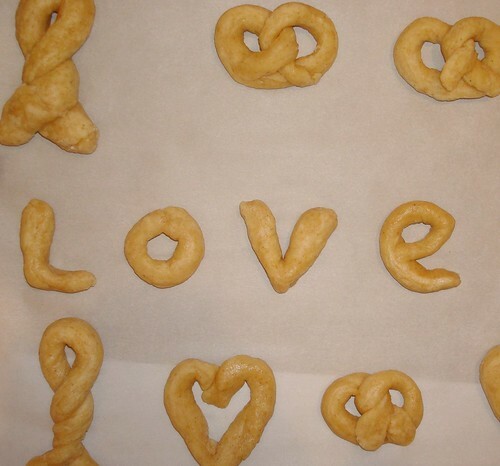 Pinch off about 1 tablespoon worth of dough for each cookie; roll into a rope and then twist into a pretzel shape, simple knot, or the letters of the name of your significant other. Place cookies on the prepared baking sheet. Bake until lightly browned, about 10 minutes. Transfer the cookies on to a wire rack to cool. If you're making them with frosting, go ahead and whisk the cream and almond extract together in a small mixing bowl. Beat in the confectioners' sugar bit by bit until it is smooth and of your desired consistency. Drizzle over the cooled cookies. Either way, store in an airtight container. These cookies keep beautifully when frozen. For more, visit Serious Eats!